If you have been reading along, you know: I make mud, I need lines, and I cannot get white space at all. Well, in a moment of mad inspiration, I realized snow is white. Let’s paint snow! In my part of the world (California), we are in the midst of a hideous wildfire, which fortunately bypassed our neighborhood, but which could be visited by a fire any time. Crazy winds and no rain make for dry and dangerous conditions, and certainly the last place where you will expect to find snow. Thus, snow. 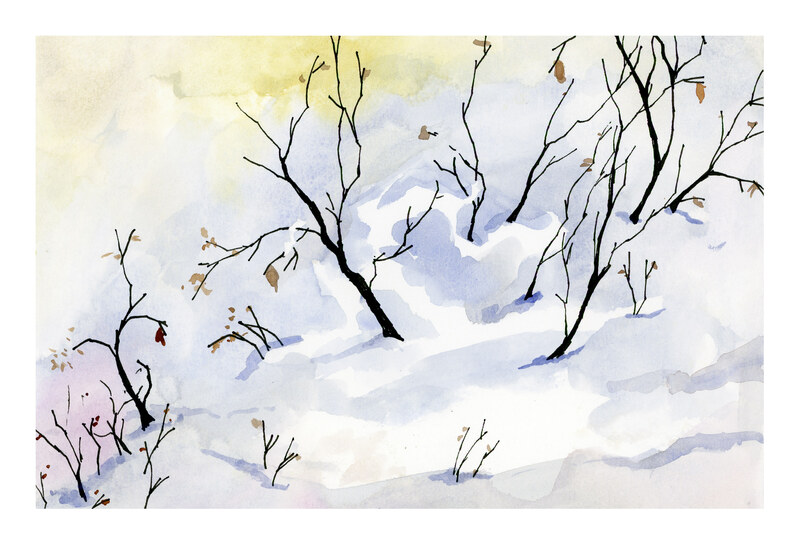 I went to my favorite place (YouTube) and searched for “watercolor snow” and there we were! Lot of them. In particular, I found Peter Sheeler, whose videos are simple to follow, and quite lovely. He uses a minimal palette, and just paints. Subtitles let you know the colors and the technique. Pleasant music moves you along. Here is my version of his painting. Peter Sheeler has another video that I used as well. 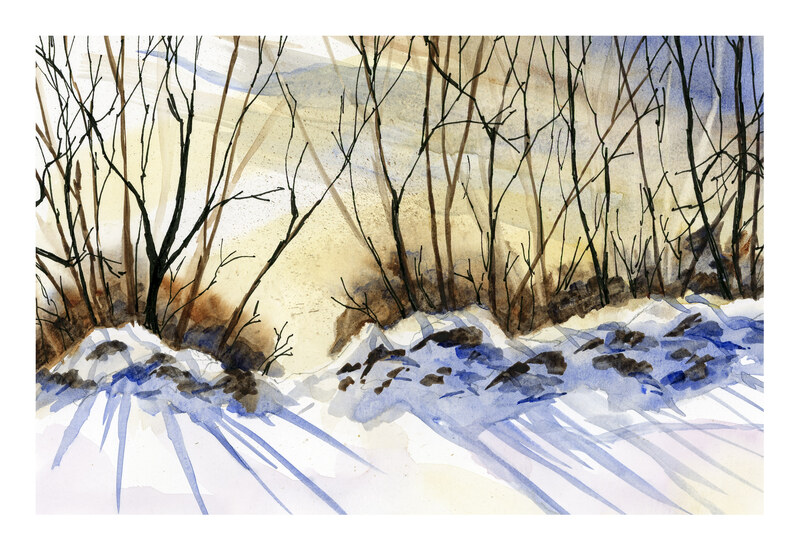 It was a bit more complex, but not only was it great for shadows on snow, he has very strong light – dark colors, another problem I struggle with. And here is my version of it. I was really intimidated by the dark trees and the rocks. Besides using only Ultramarine, Yellow Ochre, and Burnt Sienna (even though Sap Green is in his video’s palette), Peter uses a 1/2 inch flat brush. I have some flat brushes, and they scare the hell out of me. I think people who love flat brushes are nuts. No more: I bit the bullet and pulled out my flats and did the entire painting in a flat brush, varying sizes as necessary. And I used micron pens, too, as did Peter. Beautifully painted, thanks for the links! Thanks so much! Now if I could just do so well on my own . . .
My biggest problem is I get discouraged or distracted. I haven’t painted in weeks . . . the Labor Day weekend has that on its agenda, for sure.